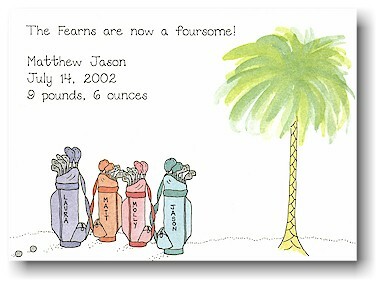 White card depicting purple, orange, pink and blue-green personalized golf bags. Specify names to be printed on bags in the comments section of the order form. White flat card with orange golf bag under a tree. Envelopes can be imprinted with your return address for an extra charge. Do you want your envelopes sent in advance?